Audrey Classic Tote - Totes & Lunch Bags 25-50% Off! These great new tote bags (or eco-conscious reusable grocery bag) by Emilie Sloan of Seattle are handy for market, beach or gym trips. Rainproof fabric just wipes clean with a damp cloth. 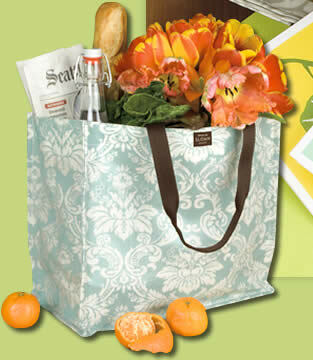 Ice blue damask outer pattern has brown handles (11" drop) and contrast interior with inner pouch pocket for small items. Zip closure at top. Cardboard bottom for sturdiness. 15 1/2"w x 12 1/2"h x 4"d. Note: inset photo shows same color but different style Audrey bag. NOTE: Only 2 left!